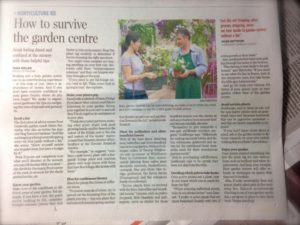 Journalists do contact us to talk about gardening from time to time. Sometimes we – or our blog – are even the subject of the article. 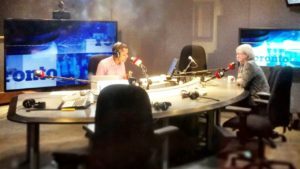 It was great fun to be interviewed by Matt Galloway on CBC’s Metro Morning – talking about why squirrels can be such a pest when planting bulbs, and how to foil the dastardly creatures. Read more about the experience, along with a “how to foil them” link here. One of the easiest ways to have an awesome garden for cheap is to have great soil, explains Battersby. But you don’t need to spend money to improve its quality. Battersby suggests putting organic matter such as leaves from your own trees and homemade compost on your garden instead of pricey products you need to buy. 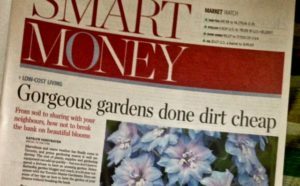 Helen Battersby is digging her new line of work — the 62-year-old has branched out from her job as a freelance copywriter and has added gardening coach to her credentials. 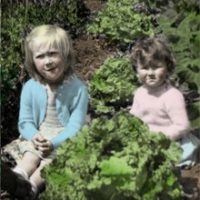 Retiring is not on her radar: Helen teamed up with her sister, Sarah, 60, to put down business roots so that when they turn the final page on their desk jobs in the future, they can easily transition into the next career chapter with gardenfix.me. So far things are coming up roses, says Helen, thanks in part to acquiring a certificate in landscape design from the G. Raymond Chang School of Continuing Education at Ryerson along with a horticultural certificate from Guelph University. 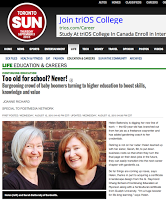 “I’m a huge booster for life-long learning,” says Helen. Two wacky sisters, Helen and Sara Battersby produce this and they’re indefatigable. Every few days, you can find something new to read or look at here. The pair live side by side in Toronto’s Beach neighbourhood and, as Helen is a master gardener, they do know their stuff. The postings are usually light-hearted, but accurate. 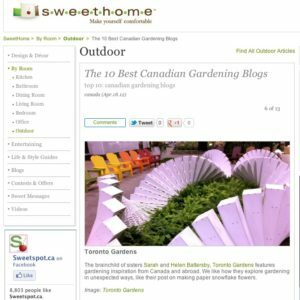 This blog just placed second in the 2014 Canadian Weblog awards (gardening section) and justifiably so. 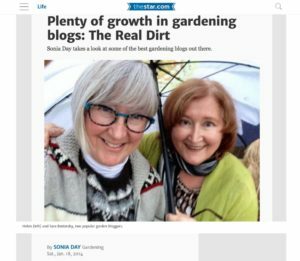 It is a reliable source of news about gardening events in the GTA and worth checking regularly in spring. The brainchild of sisters Sarah and Helen Battersby, Toronto Gardens features gardening inspiration from Canada and abroad. We like how they explore gardening in unexpected ways, like their post on making paper snowflake flowers.